MILO Philippines officially launch this year much-awaited summer break activities for our kids the "MILO Summer Sports Clinics". As MILO continue with their commitment to providing the nutritious energy to get more children into sports, MILO’s yearly program continues to offer a wide array of sports activities that kids can participate in throughout the summer. This year campaign is "Get Your Child into Sports", that aims to reinforce the importance of sports in a child’s holistic development. We all know that our kids today are getting hooked on different gadgets like cellphones, laptops this hinder them from engaging in sports. MILO’s annual summer clinic seeks to address these challenges by highlighting sports as a means not only to get kids active but also to teach valuable life lessons one can learn outside the classroom. This year, MILO expands their makes the Summer Sports Clinics to Visayas and Mindanao region. There will be over 700 venues that can cater more than 30,000 children nationwide starting end-March. MILO also add some sports apart from Badminton, Basketball, Chess, Fencing, Football, Futsal, Golf, Gymnastics, Karatedo, Lawn Tennis, Parkour, Swimming, Table Tennis, Taekwondo, Touch Rugby, and Volleyball. They also adding Arnis, Ultimate Frisbee, and Wushu. I'm sure that your kids can find their perfect sports this summer. It's been 35 years, MILO prides itself in partnering with a roster of esteemed organizations such as the BEST Center and Philippine Taekwondo Association among many others, that have been instrumental in maintaining the sports excellence that the Summer Sports Clinics is known for. 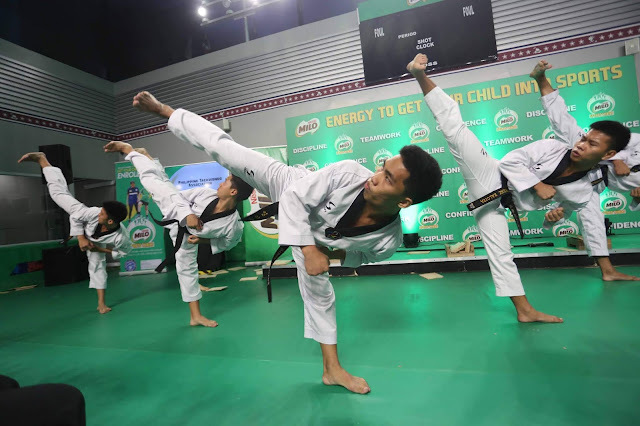 Expert coaches and instructors who have competed and won in local and international competitions such as the Southeast Asian (SEA) Games and the Olympics will handle the programs. These mentors use modern and scientific approaches that will help participants gain an appreciation for the different sports, live a healthy and active lifestyle, and embody the morals of discipline, confidence, teamwork, perseverance, and hard work. MILO created outstanding personas in the sporting scene. The roster of alumni includes BEST Center graduate Chris Tiu, Taekwondo clinic graduate, and SEA Games medalist Japoy Lizardo, and Gymnastics clinic graduate and SEA Games gold medalist Kaitlyn De Guzman.